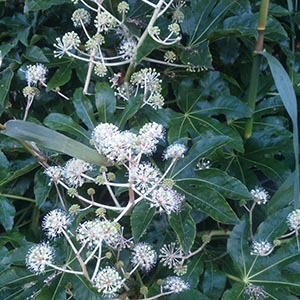 A large evergreen shrub, the False Castor Oil plant, is a very architectural plant its glossy large palmate leaves are over 300mm across, and in autumn it produces small umbels (rounded clumps) of creamy white flowers, followed by black fruits. Let’s hope there are still some on the plant. Fatsia japonica does not produce castor oil that honour belongs to Ricinus communis.